We are a licensed applicator for industry-leading manufacturers Carlisle SynTec and Firestone Building Products. In fact, we've been installing EPDM membrane roofs in Maine since they were first introduced here in the late 1970s. EPDM is a tried-and-true roofing solution for Maine's fickle climate. Millions of warranted square feet installed by our crews prove it. 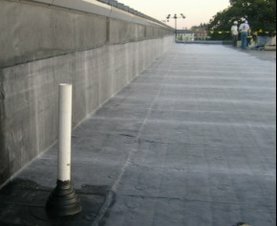 Learn more about EPDM roof installation here. In addition to Carlisle SynTec and Firestone Building Products, we are a licensed applicator for Duro-Last, Fibertite and Sarnafil - all manufacturers of thermoplastic single-ply membranes. An industry leader in green building technology, heat-welded thermoplastic membrane systems have proven their benefits in a variety of applications for a number of our valued clients. ​​Click Here to learn more about thermoplastic roof sytems. Not many contractors have the staff capable of installing slate and copper roof systems. We do. If your needs include replacement of a slate or copper roof, our trained and experienced crews are ready to exceed your expectations with their highly-specialized skills. Learn more about how we install slate and copper roofs here.